Welcome to our our April 2014 edition of Cloth Diaper Column! This month, we're talking about organic cloth baby diapers. We've got a giveaway to share with you, too! Plus, we've got other news, new articles, and more! "The best days end in dirty clothes." Spring is finally coming, and we're more than ready for it! After a long and cold winter with a lot of snow, I'm eager to dig in the garden and get out for some hikes. I hope you're enjoying the longer days and warmer nights, too! This month, we're talking about organic cloth diapers. In organic diapers, the absorbent materials that sit against your baby's skin are made of natural fibers that have not been grown with the use of pesticides, and which have been processed into cloth without bleaches and other harmful chemicals. Organic diapers are primarily cotton (which requires a lot of chemical inputs), but also hemp and bamboo blends (which are generally grown without as many chemicals). Even in organic diapers, the outer (waterproof) shells are made with waterproof materials like PUL and TPU, but the shells do not lay next to baby's skin. If you would like to work with only natural materials, prefolds and fitted cloth diapers pair wonderfully with wool covers for a more natural option. 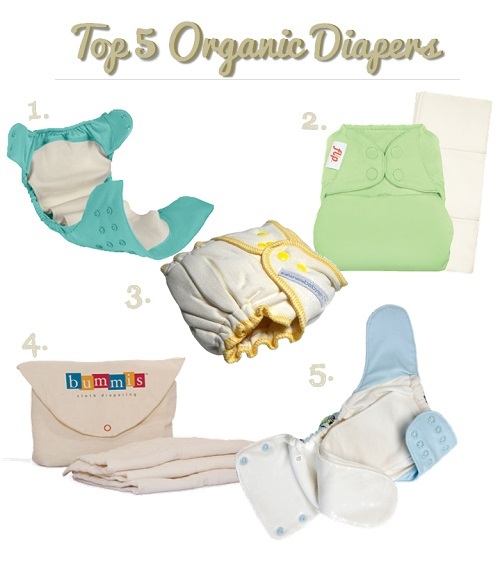 You can read more about our favorite picks in our full article highlighting our Top 5 Organic Cloth Diapers. When you visit our site, you may notice some changes! We are working on updating many of our articles with new graphics and more details on our experiences with them. Watch for these as they are finished up in the upcoming months. Did you see Gro-Via's Earth Day campaign? They're trying to shed some light on the amount of water it takes to wash cloth diapers. The comparisons they use (coffee, bathtubs, and disposable diapers) are fascinating. You can check it out here. Are you taking part in the Great Cloth Diaper Change this Saturday? This event builds awareness for cloth diapers, and your baby can be part of a Guinness Book of World Records feat - most diapers changed at one time! Find a host location near you here! Gro-Via Organic All-in-Ones are on sale at Gro-Via during their Earth Week Sale (ends April 27) (US only)! Newborn Organic All-in-Ones are $11.96 each, or buy their discontinued prints for $9.95 each! For Canadians, check out Lagoon Baby's Earth Week Sale - 15% off top brands including Applecheeks, AMP, Gro-Via, Blueberry, Funky Fluff, and much more with code EARTH14, ends April 26. Like these? You can subscribe to our cloth diaper sales round-up to get deals just like this one delivered to your in-box (just click on the weekly round-up link above and then fill out the sign-up form at bottom of the article). One of the areas I find incredibly time consuming is cooking. I love to cook, but it's hard at the end of the day! I have been trying to cook two meals at a time - I prep one recipe and double it to freeze half, or I prep a single ingredient and use it in two meals. One of my favorites is frozen ground meat... it freezes beautifully, and is a quick add-in with a jar of tomato sauce for spaghetti and meat sauce, one of my son's favorite meals!